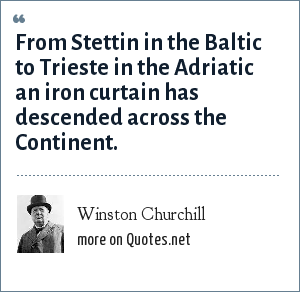 Winston Churchill: From Stettin in the Baltic to Trieste in the Adriatic an iron curtain has descended across the Continent. Winston Spencer-Churchill, generally known as Winston Churchill, was a British Conservative Party politician and a grandson of former Prime Minister Sir Winston Churchill, who was also his namesake. "Winston Churchill Quotes." Quotes.net. STANDS4 LLC, 2019. Web. 23 Apr. 2019. <https://www.quotes.net/quote/5847>.